A ll of our personally bred horses are trained by our professional staff. Each horse is gently started under saddle between the age of three and four years. As appropriate to age and ability, they are trained in hand and mounted to build confidence, suppleness, and trust. We also accept a limited number of horses for boarding and training at most ages. Please see our trainer information below and contact us to discuss your specific needs. Mary Goldberg is the owner of Sport Horse Sales of Texas. She is an avid horsewoman with a lifetime of experience in the breeding and training of horses. Mary has extensive experience with the western discipline as a barrel racer for many years and has shown in dressage through 4th Level. Her gentle nature and love of horses creates a warm, caring atmosphere at the ranch. Ivy is an FEI rider, trainer and clinician. She grew up on a warmblood breeding farm and has extensive knowledge of all aspects of care for the sporthorse. She was a member of Pony Club and an avid hunter/jumper rider who started off riding with Karen Goodell and Lynn Klisavage. Riding with both of these talented and knowledgeable trainers led Ivy to several opportunities to catch ride many different types of horses. This also gave her the experience she needed to compete at Prelim in eventing. She loved using jumping and cross training for her dressage horses and took several clinics with Olympic medalist Greg Best on her Oldenburg stallion. At the age of 8 she started training with Janet Foy (now a top clinician and 5-star judge) and was Janet’s working student for several years. Ivy was also given the opportunity to ride and show Janet’s Grand Prix gelding. With these opportunities, she was able to earn her bronze medal as a 13 year old (and, later, her silver medal). At age 15, Ivy made the Young Rider team on Maximilian, a Hanoverian stallion. At that time Ivy focused on breaking and riding the young stock at her home farm. This experience with young horses was invaluable. Her understanding and work ethic was noticed by several, and soon she had a full barn of training horses. After graduating high school, Ivy decided to join the world famous Lipizzaners, again an experience that was packed full of learning. This gave her knowledge of long lining and the art form of the airs above the ground. Since then, Ivy has ridden, trained and shown through Grand Prix, with several year-end awards. She has ridden and trained under some of the top trainers and instructors, including Janet Foy, Axel Steiner, Betsy Steiner, Tom Poulin, Lilo Fore, Carol Lavell, Gerhard Politz, Christopher Hickey, Sandy Hotz, Shannon Dueck, Jan Ebeling, Jeremy Steinberg and Gabriel Armando. She focuses primarily on coaching her students in the Houston/Cypress/Richmond area at both schooling shows and recognized shows, including Region 9 Championships, but also takes on some projects for training and sales. Ivy enjoys working both with those new to dressage and those perfecting their skills – either for pleasure or with show goals in mind. She has a soft spot for working with unexpected breeds, including Dutch harness horses and draft crosses. She believes in being personal and encouraging horse and rider through anxieties and weaknesses. Her education is grounded in traditional dressage principles, but she also likes to try new approaches and ride horses out of the arena, making sure they are comfortable in a variety of environments. In addition to clinics, lessons and show coaching, she offers training rides and is happy to get on a client’s horse in lessons when needed, to work through issues or teach new skills. Andrea is a USDF Silver medalist and British Horse Society qualified instructor. She has been working in the industry teaching, riding, showing for the past thirty six years in a variety of settings to include the Dubai Equestrian Center in the U.A.E and at Singapore’s first public riding school, The Turf Club. 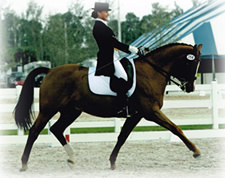 Andrea and her students participate at all levels in regional and schooling dressage shows. She provides a full service training program for children and adults of all ages and at every stage in their riding, beginner through F.E.I. She offers training rides, lessons, coaching at shows, horse care management, and is available to help navigate a new horse purchase. Come join her team!